What a beautiful time of year to live in Arizona. We are enjoying some of the best weather in the country right now. Now is an awesome time to get your home ready for the upcoming summer weather that we know is just around the corner. There are several exterior home improvement projects to do before summer that will help you enjoy your home even more in the coming months. One thing that every home needs in the summer months is an outdoor living space. Although the days are hot, we continue to see beautiful temperatures at night and in the mornings well into the summer months, and a little time outdoors helps us tolerate being stuck inside when it is 110ºF outside. 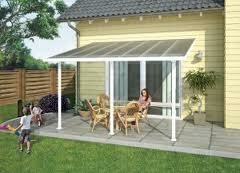 Patios come in lots of different styles and price ranges, so there is something for almost any home. Simple Exterior Home Improvement Projects To Do. You can build a variety of styles of outdoor living space in your backyard from the simple lattice patio cover to a complete weatherproof roof structure with everything from mist systems and outdoor entertainment to potted plants and wind chimes. If you can dream it, we can build it for you here at Rictor Contracting. There are plenty of exterior home improvement projects to do in Arizona. Don’t Forget About Outdoor Lighting! Outdoor lighting is always a smart investment in your home’s exterior. Lighting not only decreases the likelihood that you will be broken into at night, but it also provides a measure of safety for you and your guests by increasing the visibility around your home at night. As always, if you are in need of an excellent contractor to help you with something around your house, please contact us here at Rictor Contracting for the name and number of a trusted contractor that we are proud to refer to you. If you have some exterior home improvement projects to do, but don’t feel comfortable doing it yourself, we’ll gladly guide you every step of the way!